For an hour of your time, Robin Ince will give you a crash course in the most sophisticated object in the universe, the human brain. Drawing off inspiration from his own recent brain scan and his fascination with everyone else’s, Robin engages the audience’s curiosity throughout the hour, using stories and examples ranging from Professor Brian Cox to the waggle dance of the Bumblebee. Being in a room with Ince is worth the ticket price alone; his ability to make intelligent subject matter like the inner workings of the brain and the work of Peter Higgs easily accessible, and often completely silly, is remarkable. Every piece of material thrown at the audience is interesting, and there is never a lull or break in pace. Ince’s intensity makes him a mesmerising performer; he’ll shout, gesticulate, grimace and roar. Every sentence is delivered with intent to make you laugh, no energy is wasted. You’ll even learn as you laugh, but never feel patronised. Ince’s lack of pretention is key as his show relies on him introducing you to ideas and theories from intellectuals and scientists. 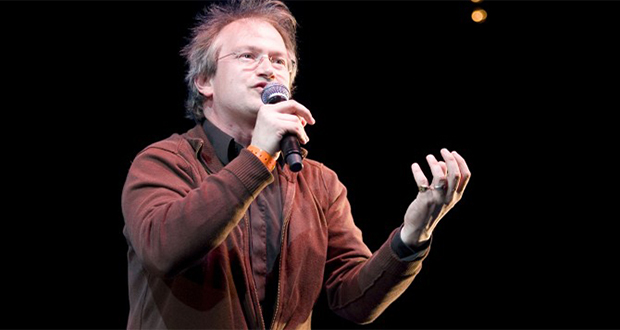 This has the potential to be delivered as preachy or obnoxious – but not with Robin Ince. To get the full experience from Ince’s stand up, it’s important to keep up with him, which can be difficult. He commented before the show that his material was proving to be overlong for the hour already, despite the fact that Robin blasts out the funny at 100mph. The laughs come thick and fast here and there’s not much time to breathe, not for the audience or Robin himself. Allowing himself to get sidetracked and break off into tangents didn’t help the fact that his show was already being rushed into an hour, although these were always enjoyable. The audience may have been left wondering though, what material was missed in the show ending prematurely due to time constraints. At the beginning of the show Robin made an “on-stage, off-stage announcement” that his voice was going to be weak and so he would be using a microphone, something which isn’t common of a Robin Ince performance. Despite Robin’s fears that he remarked on during the show, the microphone meant that he was perfectly audible and his delivery was still as strong as ever. It shows the strength of his delivery that his shaky vocal chords survived his trademark shouts and even a Brian Blessed impression. This is a great show full of laughs and well worth your time, particularly if Robin’s voice comes back to full strength and he works out his best material to fit within the show.